My name is Danielle and I am a Canadian freelance writer. I am a self-professed dweeb with a dash of geek who has a BA in English and Awesomeness. I have an obsession with running and cats and I also love to read, write and listen to angry music. I value learning for the sake of learning, proper grammar and the touch and smell of a real book. “Pluviophile” is derived from the word “pluvial” which means “of or relating to rain” or “characterized by abundant rain”. Adding “phile” to the end of a word is an indication of love and adoration and is derived from the Greek word “philos” which literally means ‘loving’. 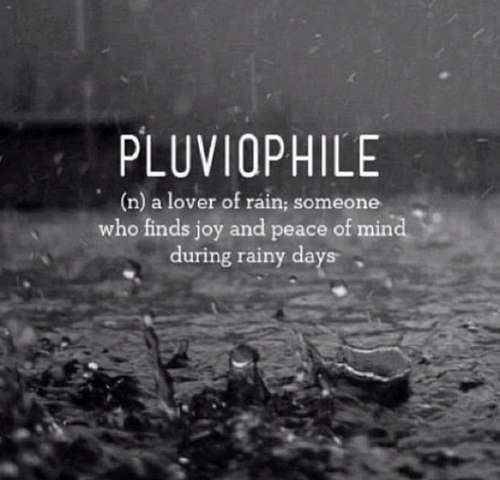 For example, I am also a bibliophile, which literally translations from Greek as “biblion ‘book’ + philos ‘loving’.” So a pluviophile is someone who loves rain. I find rain extremely calming and love the feel and the sound of it, I also personally believe it endorses the best environment for reading! I just found it on Google as well, but thanks for checking! BA in Awesomeness!! Haha what are you..